Can you ever really know if love is true? And if it is, should you stop at anything to get it? Two decades ago, Erin Edwards was sure she'd already found the love of her life: Nate Lawson. Her first love. The one with whom she shared everything--dreams of the future, of children, plans for forever. The one she thought she would spend the rest of her life with. Until one terrible night when Erin made a mistake Nate could not forgive and left her to mourn the relationship she could never forget or get over. Today, Erin is contentedly involved with a phenomenal guy, maneuvering a successful and exciting career, and raising a great daughter all on her own. So why would the name 'Nate Lawson' be the first thing to enter her mind when her boyfriend asks her to marry him? Always Something There to Remind Me is a story that will resonate with any woman who has ever thought of that one first love and wondered, 'Where is he?' and 'What if...?' 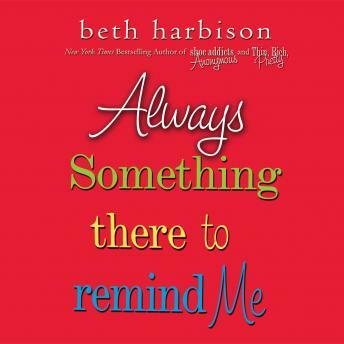 Filled with Beth Harbison's trademark nostalgia humor and heart, it will transport you, and inspire you to believe in the power of first love. This was a painful read. A pathetic woman who cannot conjure up a life for herself because she is stuck in a teenage story that reiterates to women that we are nothing with out a man. I fear for the young women who will read this and perpetuate a standard that degrades the female existence. The author herself mentions that young girls are impressionable and emulate the silly stories they are exposed to. Why then create yet another silly story?